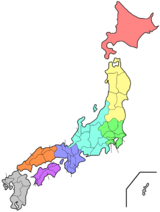 Ōita Prefecture (大分県, Ōita-ken) is a prefecture in the Kyūshū region of Japan on the island of Kyūshū. The capital city is Ōita. Ōita is well known in Japan for its many hot springs. In the 6th century, one of the regions of Kyushu was divided into Bungo Province and Buzen Province. After the Meiji Restoration, districts from Bungo and Buzen provinces were combined to form Ōita Prefecture. 1184 (Juei 3): Usa Shrine was destroyed by fire in Gempei War. Ōita Prefecture is on the north-eastern section of the island of Kyūshū. Ōita is faces the Suo Channel and Honshū Island to the north. The prefecture looks towards the Iyo Channel and Shikoku Island to the east. It is bordered by Miyazaki Prefecture to the south. Fukuoka Prefecture and Kumamoto Prefecture are to the west. National Parks are established in about 28% of the total land area of the prefecture. Sasamuta-jinja, Usa-jinjū and Yusuhara Hachiman-gū are the chief Shinto shrines (ichinomiya) in the prefecture. Fukiji Temple has the oldest wooden structure in Kyushu. The Usuki Buddhas include 60+ cliff carvings from Heian period. ↑ Nussbaum, Louis-Frédéric. (2002). "Ōita-ken" in Japan Encyclopedia, p. 742; Japan External Trade Organization (JETRO), Oita Prefecture, Regional Information; retrieved 2012-4-6. ↑ Nussbaum, "Ōita" at p. 742. ↑ 4.0 4.1 Oita Municipal Guide Book, History of Ōita; retrieved 2012-2-9. ↑ Davis, p. 147; History of Ōita; the noun "Kōan" means the Japanese era name for a time period which started in February 1278 and ended in April 1288.